I’ve been singing this at various carol services in schools and churches this year. I got it from an old, out-of-print music scheme called “Ears and Eyes”, by Jack Dobbs, Roger Fiske and Michael lane, published by OUP in 1974. If you can lay your hands on it, grab a copy – it is full of unusual folk songs and carols. This is presented as a “traditional American Carol from Harlem”. I sing it a cappella, as a call and response “story song”. 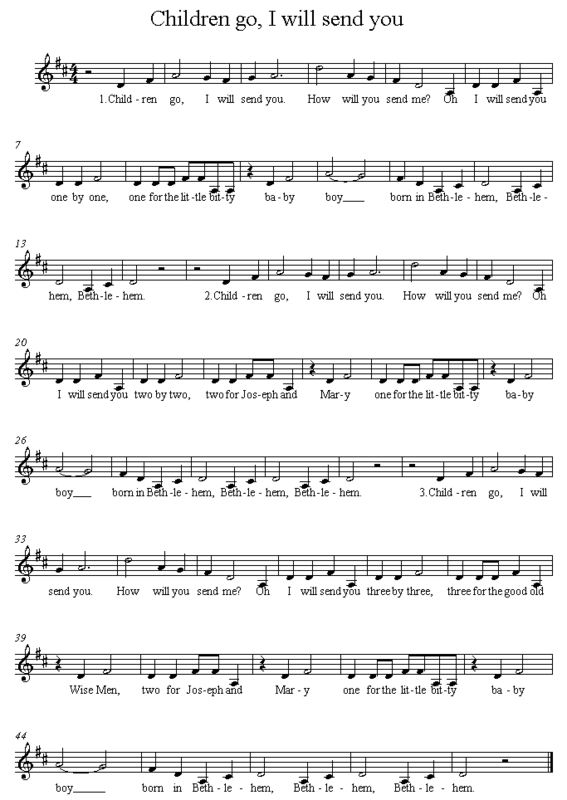 The leader sings “Children go, I will send you.” Everyone answers “How will you send me?” The leader replies “Oh I will send you one by one” and everyone joins in from there. It works like “the Twelve Days of Christmas”, in that you add a verse each time. At one school, several children came up to me with extra verses involving angels, shepherds and other characters from the Christmas Story. I hunted around on Youtube – there are lots of different versions, upbeat, gospel, bluegrass – take your pick. This entry was posted in Songs and tagged Christmas, Christmas Carols. Bookmark the permalink.